In a well-written and fantastically-footnoted 2011 article, Jeffrey R. Asher of Georgetown College (KY) connects Homer to Ephesians 6 (“An Unworthy Foe: Heroic Ἔθη, Trickery, and an Insult in Ephesians 6:11,” in the Journal of Biblical Literature Vol. 130, No. 4; Winter 2011). Homer’s Iliad and Odyssey are part of our regular reading rotation here at the Torrey Honors Institute, and of course so is Ephesians. So we’re always glad to see deep connections, and that’s what Asher makes: this goes way beyond “Paul mentions armor, and there’s armor in this old war story.” It’s an insight into Homer as well as some background for Paul. “Put on the armor and stand.” Asher notes that “in the Iliad, strength is associated with two principal motifs: with the donning of armor, with which the hero obtains strength, and with the gesture of standing, in which the strength of the hero is displayed.” That is, Homer has two main ways of depicting strength, and he develops both of them with great care. Armor: not only do lots of soldiers armor up, but Homer slows down the narrative and carefully relates some of the arming. When Achilles puts on his new, heaven-forged armor and takes up his legendary shield, he acts out the highest point in a long series of armings. “Of arms and of the man I sing” may be a line from Virgil, but he was channeling Homer when he wrote it. In the Iliad, armor gives strength in two ways: by having a powerful origin story, and by having effects both physical and psychological, on both its wearer and his opponent. Again, Achilles is the apex of these phenomena: the armor of Achilles is the armor of a god, made just for him and just for the evil day. And when he puts it on he knows himself to be stronger, and the entire enemy city of Troy knows him to be stronger –unstoppably the strongest, in fact. As for the second way of depicting strength, standing, that too is prominent. Lest you think we’re making too much of standing (after all, everybody has to stand sometimes; it could be a trivial posture), there’s a footnote (did I mention this article has fantastic footnotes?) to some scholarship by Jan Bremmer on “Walking, Standing, and Sitting in Ancient Greek Culture” in a book called A Cultural History of Gesture (a subject about which it is apparently possible to know things). According to Bremmer, the two main gestures for a warrior to demonstrate his strength are “striding” with an aggressive gait and “standing” with firmness. As he points out, “ίστημιa and its substantival cognates are common gestures for strength in the Iliad.” In fact, Homer says that “if one is to win honor in battle, he must by all means stand his ground strongly [τον δε μάλα χρεώ έστάμεναι κρατερώς]” (Iliad 11.409-10). And in the Iliad, the opposite of standing is not necessarily running away, but falling over (like a tree, as the epic simile inevitably goes). Where did Paul get his battle imagery? He was no soldier, but a Pharisee. The most relevant background for his battle imagery is the Hebrew Bible, especially Isaiah 59 where the LORD arms himself for victory. Anybody who downplays that biblical context simply isn’t thinking like Paul. And that Isaianic imagery was also being picked up by other Jewish writers of the second temple period: it’s present in the Wisdom of Solomon and Qumran sources. But some scholars have suggested that the soldier imagery was also brought to Paul’s mind by his close contact with Roman military personnel in the period of his arrests and detainments: He could have been looking at an armored guard while writing Ephesians 6. So with Isaiah as a definite biblical source and a Roman soldier as a plausible visual source, why poke around in Homer for additional sources of Ephesians 6? Because as Paul wrote these ideas down in Greek, it’s very likely that the Greek classics were part of his specifically literary equipment. Lines of Homer were so pervasive in elementary education in the Greco-Roman world that children would practice their letters by writing Homeric sentences. And once you pick up on the way Homer describes warfare, you notice some particular expressions and conventions that help explain some of Ephesians 6’s peculiar phrasing. For example, Paul pictures two groups of combatants: on this side we have the armored stand-takers, and on the other side we have sneaky spear-throwers or archers. Each group has “distinctive martial characteristics and practices,” and the enemy is “depicted as one who uses stratagems or tricks (6:11) and missile weapons (6:16).” The believers should be strong and show their strength, but their enemy hides and takes shots at them. Now in Greek literature, cunning warfare was prized. Again, Asher’s footnotes can point you to a fascinating world of scholarship on this subject. A general who could out-plan and out-maneuver his opponent was not only successful but was also praised for his cleverness. Homer evidently delights in describing the trickster strategems of wily Odysseus, polytropic hero, man of many twists and turns. But when cunning is contrasted with an open display of strength, it usually has bad connotations. That’s why, alongside all the texts that praise cleverness in battle, there’s an equal mass of texts that condemn trickery and treat it as something shameful. Broadly speaking, Homer and the traditions that flow from him have two different ideals for a warrior: the Achilles ideal and the Odysseus ideal. But in stories where they are directly juxtaposed, it’s the Achilles ideal that is the honorable one, and the Odysseus one that runs the constant risk of shame. Taken by himself, Odysseus can be a role model for all sorts of warrior virtues. Asher notes that “Although Odysseus is a complicated and multifaceted figure in subsequent Greek literature serving as a paradigm of virtue and self-control … he remained throughout subsequent Greek history a model for the use of the heroic ethos of cunning in battle.” He’s a thinker, a schemer, and an archer. But when the trickster is juxtaposed with a strong man taking a stand to display his strength, there is something so un-warrior-like in the trickster’s avoidance of confrontation that he becomes the object of scorn and mockery. 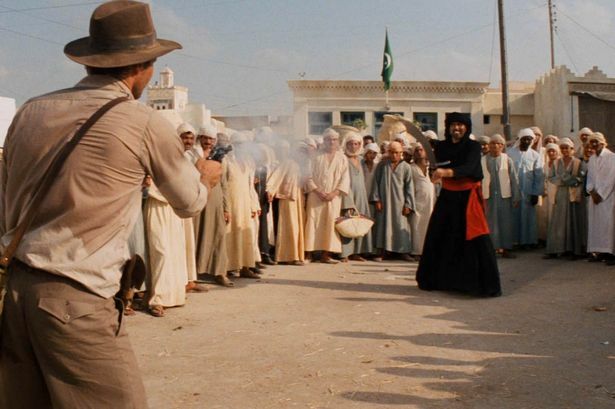 When Indiana Jones in the Tunisian casbah is confronted by an obviously formidable warrior with a scimitar, he responds by shooting him from a safe distance. That’s because Indiana Jones is Odysseus, and when we cheer him for killing his better with a missile, a little thrill of naughtiness adds to our delight. Rumbling around in the background of the battle scene in Ephesians 6 is a battle scene from Homer. Believers are to don armor together and display the strength of that divine armor by taking a stand, like some collective Achilles. Paul casts shame on their opponent, a wily enemy who launches missiles from a distant hiding place.